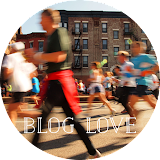 If you like what you see/read here, Kurt is working on his own blog with a focus on city planning issues. Be sure to check it out over at Urban Scouting. Thanks, Kurt! This trip has been a few years in the making. My boss's father Lani began this project in 2006 with the support of Rotary International. The project is focused on providing water tanks for the Village of Falelima in Samoa. The village does not have any access to well-water, so all potable water must be either collected from the rain or purchased and delivered - for much more than a dollar a bottle (even though the water is coming from no farther than the main island). 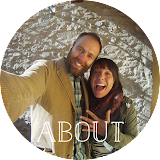 At terrain our primary focus has been to raise funding for the project. My boss, Steven, went on the first volunteer work-trip back in the spring of 2006 and helped with surveying the first phases of the project. Each time Steven's parents come to New York City to visit we get together and discuss Lani's recent travels to Samoa, how the project is coming along. One time we watched a documentary that a friend of his did on a work-trip. And for the past year or so we'd been discussing how and when I could make my way to Samoa for a work-trip. Finally in February Lani called and said everything was lined up for a late April, early May trip. There was no hesitation on my part, I could not wait to go! I hope you enjoy the documentation of the trip. 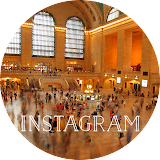 At around 1 PM NYC local time on Wednesday the 18th, which is 7 AM local time Thursday the 19th in Auckland, I tossed my bags on my back and headed for the subway (then NJ Transit and then Newark AirTrain) for the Newark Airport. My 28 hour door-to-door journey to some islands in the midst of the Pacific Ocean on the other side of the equator had just begun. As with most good things the photos begin 36,000 feet above my beloved home state of Ohio. I can't even begin to explain how well I know that river valley and those roads. Our flight also flew directly over the Grand Canyon! Los Angeles. I've never been and after flying over I feel that I'll never need to go either. Air New Zealand Boeing 777-300ER. I could've booked a Quantas flight for $150 less, but a) what's $150 when you're spending $1,600?! and b) everyone with experience claimed Air NZ was the greatest flight experience they'd ever had. It was. Everything about the interior of the aircraft was so well designed, from stainless steel silverware etched with the Air NZ logo to the incredible personal touch-screen tv (with loads of entertainment) and the cool bookshelf wall print in the bathrooms. And the food was nothing to complain about, oh yea, and unlimited wine, beer and liquor. 13 hours in (even a well designed) time-capsule, is mind-numbing - double that when you mistakenly watch this movie at the start. Nevertheless I arrived in Auckland! It was 6 AM local time Friday (pesky international date line cost me Thursday) which was 2 AM Thursday in NYC. It was pretty much straight to work. I met my boss's (Steven) parents (Lani and Beryl) and sister (Sandra) at the airport. We had breakfast, a bacon and egg pie and a flat white, before going home and getting to work. We met with veteran Falelima Water Project volunteer Roy and went supply shopping! We arrived very late Saturday evening/Sunday morning. Fortunately the Samoans moved the pesky International Date Line, which kept things a bit simpler. We stayed the night at the Airport Lodge. Fresh fruit for breakfast - not pictured were the stack of pancakes and maple syrup Lani ordered as well. All of our gear loaded into the rental truck (in NZ they call a pickup truck a 'ute'). Roy and me on the ferry from Upolu (main island) to Savaii (larger but much less 'main' island). Satuiatua (website & Facebook page, no kidding) is a great little 'resort.' 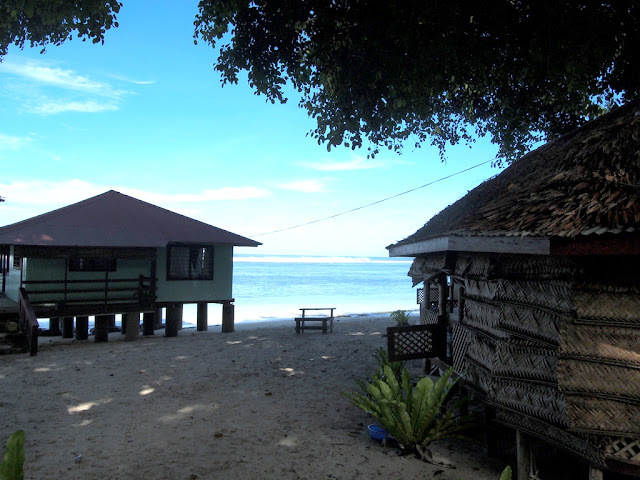 Not super developed, traditional open-air fales (fale - pronounced fah-lay - means house) right on the beach, open-air dining/restaurant/bar area and a sort of nice outhouse style bathroom and shower setup. Roy and I slept in the fale on the right of this image, it was the closest one to the water. I recommend sleeping to the sound of the ocean sometime! Shortly after our arrival to the village was a welcoming ceremony with the chiefs of the village. The ceremony was very formal and followed what seemed to be a very well-defined structure - every chief had their turn to speak and they all seemed to have a lot to say (Lani managed to do some translating). Folasa is the primary chief of the village and is Lani's first cousin. At the ceremony we were fed breakfast, I only call it breakfast because we still ate lunch and dinner later that day - I went to bed with a full tummy. In the photo above we have several different types of meat covered, chicken in the pink bowl, then beef and pork in the other two (take your pick, I don't know which was what!). 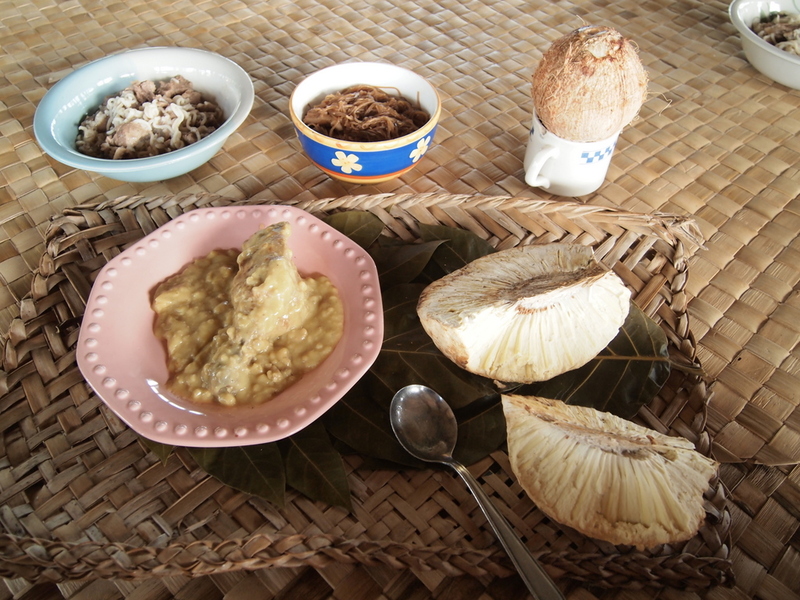 At the right is breadfruit, tastes like paper, but when dipped in something (like coconut cream) it's pretty good. Opening all of the presents we brought the newly formed 'water tank maintenance committee' (there's literally a committee for everything in the village). We went to visit the primary school that evening. 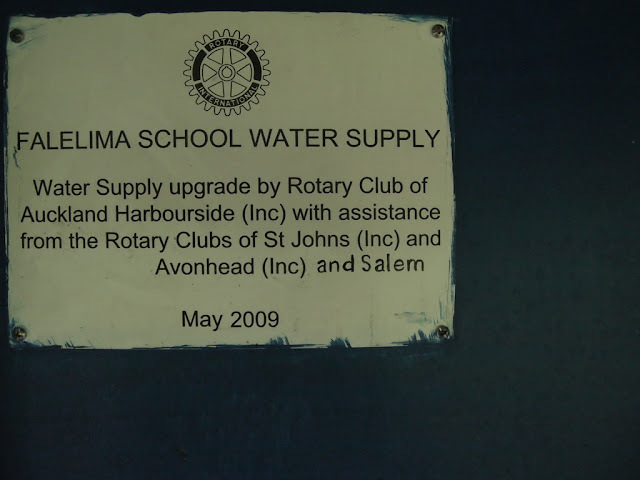 Originally the water project began with Rotary International funding - through the Auckland local club. So given my history as a foreign exchange student through Rotary I went back to my local club in Ohio and pitched this project to them for their funding support. They never hesitated to jump on-board. Lani was kind enough to be certain the club in Salem, Ohio received credit! 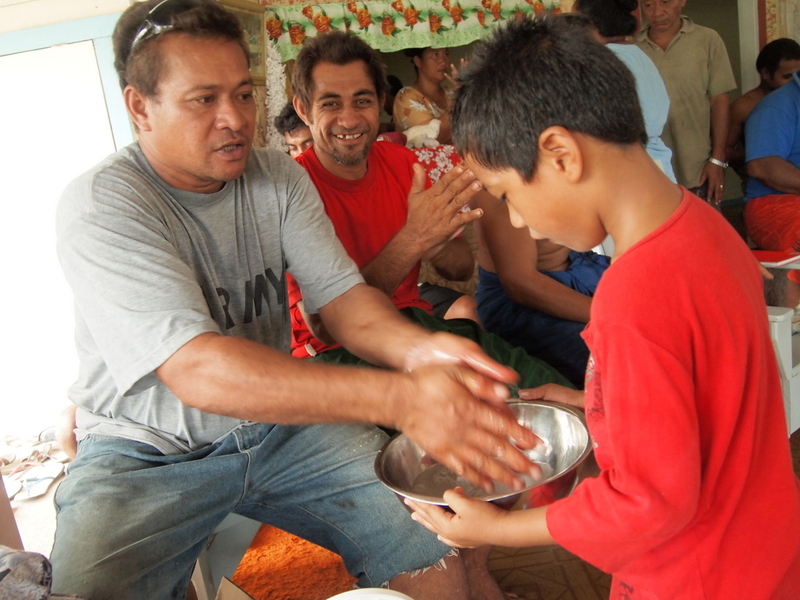 Malu (the chief's wife) and Fa'atupu (son) setting the dinner table (the kids were incredibly disciplined when it came to helping their mother set the table, I've never seen anything like it). This is not at all customary for Samoans. 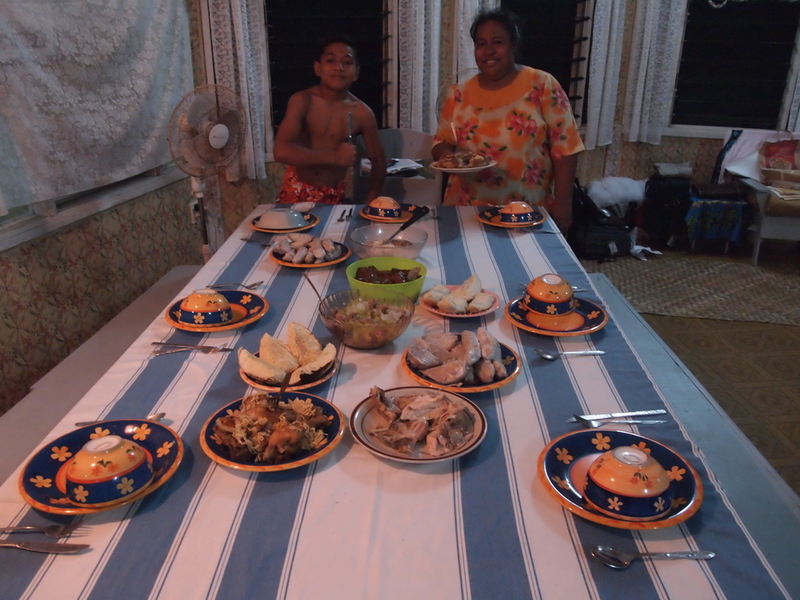 Families always eat seated on the floor of the fale (house) in a circle, but when they have visitors they pull out all the stops. This was the day I began to learn about island time. Shortly after breakfast I went back to my room, grabbed my work gloves then went to find Roy, I thought it was time to get to work! 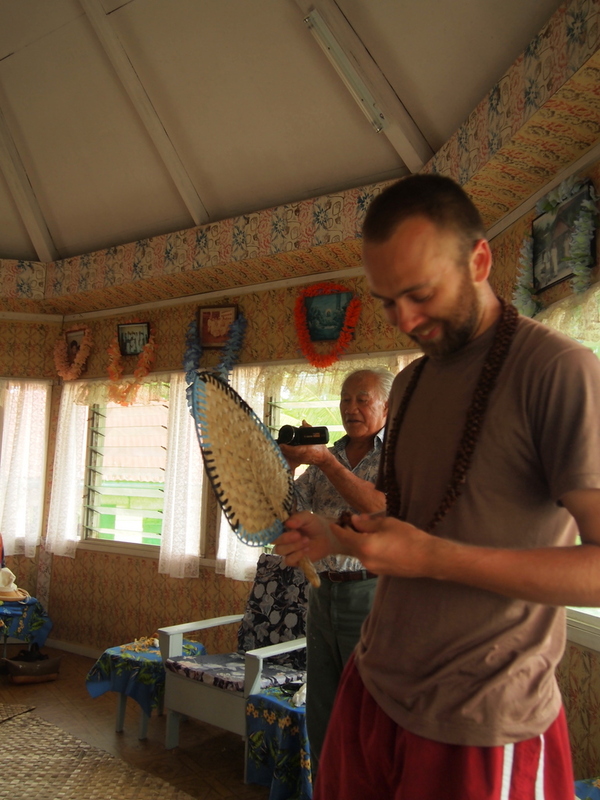 Roy was seated in the fale, reading a paper he'd brought from NZ and I asked what the plan was for the day. He said he had no idea, but I shouldn't worry. Just sit down, relax Lani will come to get us or "the work will come to us." I was a little confused for a moment, but then I could feel the heat and myself beginning to sweat without having done anything at all. So I decided, "yea, sitting down and relaxing for a few sounds like a good idea!" To my surprise I had my own bedroom, complete with a mosquito net! Malu has every major family event framed around the fale. Fa'atupu posing. I found that almost all Samoans love to pose for the camera. Roy and I set out with the maintenance committee to assess the condition of a number of the tanks at different family's houses. This is a pretty typical water tank although all of the new ones are plastic. We encountered a lot of leaking spigots. It was good to see some bleach at the tank of this family's house to sanitize their water. This woman is weaving a fine-woven coconut mat. The broad-woven mats (on the floor) are for everyday use whereas the fine-textured mat that she's working on is only for weddings, funerals or a significant village event. These mats can take up to a year to weave! There are no refrigerators in Falelima, so food sits out between meals. Wow. I never knew what sugar cane looked like. You basically just gnaw away at the stalk, sucking the sugary liquid out, then you spit out the pulp left behind. Beryl and Lani buying bread at a store along the way. We took the bread back to the village, it was a treat for them as they rarely have bread. Vaisala Beach Resort which is at the far tip of Savaii, about 20 a minute drive from Falelima. The gang: Lani, Kosena, Roy, Fa'atupu, me, Marjorie and Beryl. Salt water does wonders for allergies and the sinuses! Another day, another lesson in island time. The delivery of new gutters and water tanks that was supposed to arrive Tuesday arrived on Wednesday. But what arrived was only half of what was supposed to arrived, and one of the tank lids was broken. It was incredibly frustrating for Lani. Organizing a trip like this where you have to coordinate so many moving parts a very long time in advance from one country to another is far from easy. Adding to that is the necessity to be as efficient as possible with the time of the volunteers on the trip - you want to have things in order to get as much done while you have the people there to do the work. While the men in the village worked to unload the delivery. Lani, Roy, Folasa, Fa'atupu and myself headed off to Salelaloga (pronounced: sa-lay-la-longa, the 'g' in Samoan is actually 'ng') to get some more work supplies. Our main focus was to investigate the cost of constructing wood frames to lift the water tanks up higher off the ground so that the maximum amount of positive water flow from a tank is utilized. One of the views along the main (only) road that wraps around the island - Coast Road. The Home Depot of Samoa: Bluebird. Browsing the aisles I saw some green boxes that looked very familiar, after closer inspection I confirmed that there is something in Samoa from Ohio. Roy and I spent a good amount of time calculating how much wood we would need to build a frame to support a 1,000 liter tank of water with the random assortment of lumber that Bluebird had in stock (another funny thing about Samoa is that they're half metric half imperial, which made everything pretty confusing. I don't know for certain but it's probably from historical influence from American Samoa). BBQ stand in Salelaloga. Probably BBQ chicken. Love this advertisement for Vailima. 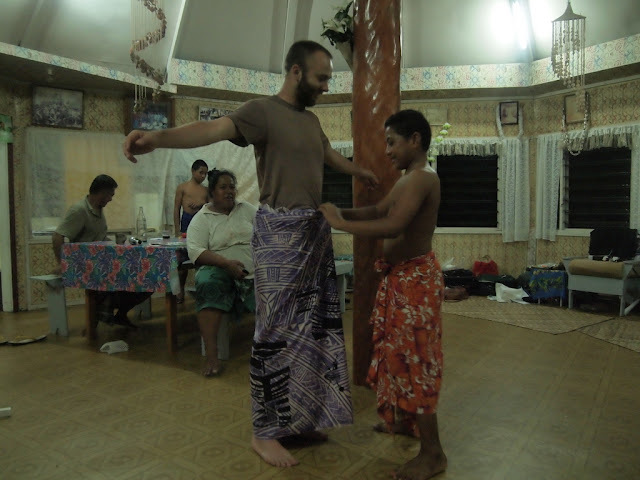 Religion in Samoa is an interesting and tricky topic. Steven had explained to me that going to church on Sunday was a very important thing for Samoans. This initially struck my as very odd, I would've thought they had their own indigenous religion. In fact they did, until the late 1700s and early 1800s when the first western missionaries began arriving to islands in the Pacific. 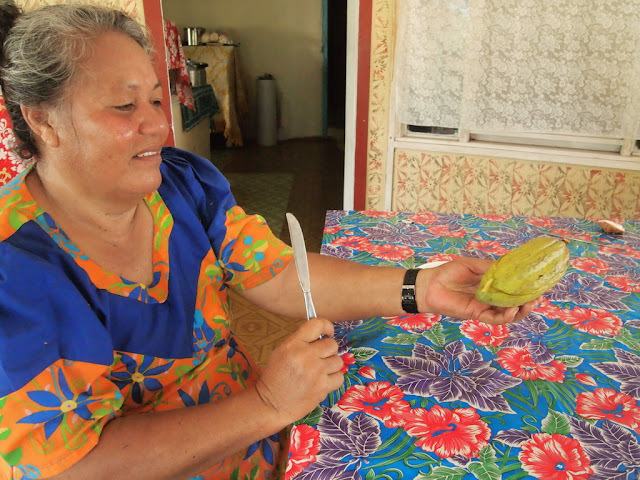 Even given this knowledge the number of churches in Samoa was surprising. And not just the quantity, but also the immaculate nature of them (and their respective pastor's houses) in contrast with the living conditions of the villagers. The most prominent were the Mormon churches (above image). 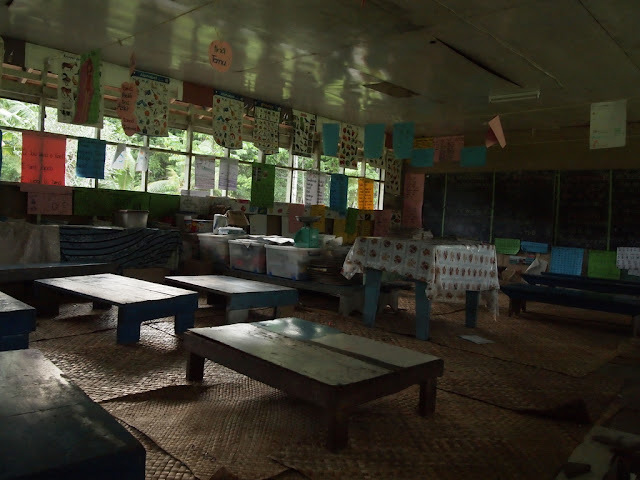 They were clearly the most well-funded, these buildings were monstrosities the likes of which you could've never imagined after seeing how the common people of Samoa live their day-to-day lives. So naturally this was a topic of conversation that I was eager to learn more about from Lani and the others who have great insight of the Samoan culture. Among the things we discussed was that the Samoans, who have so very little money, will give so much of it to the church. Even when we westerners give them money to help with their everyday needs - like water - they will give that money to the church rather than use it to help themselves. 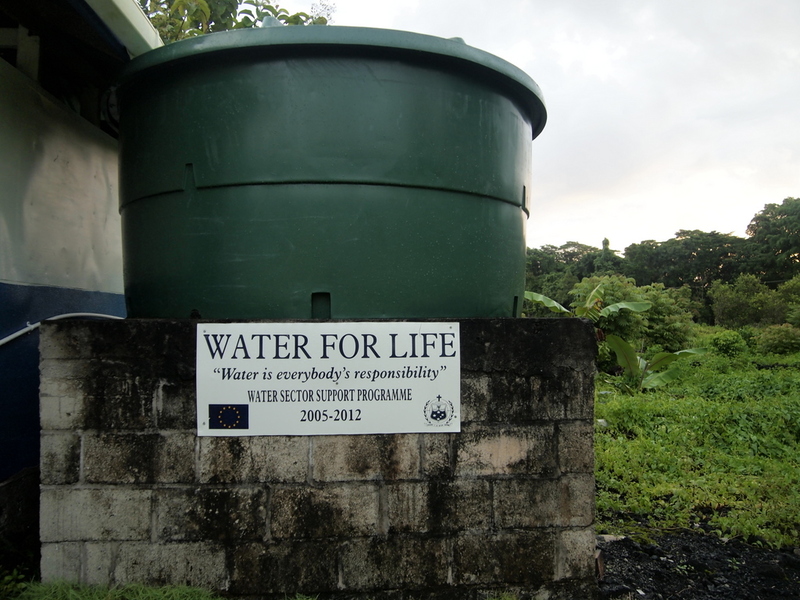 This may be one of the reasons that our water project is very focused on delivering goods and supplies and working with the villagers to install and maintain them instead of just sending them money - it's the only way to ensure that the resources go towards that which they need most. In front of houses along the roadside families would put up for sale different items, stacks of coconuts were very common. One in a million photograph. 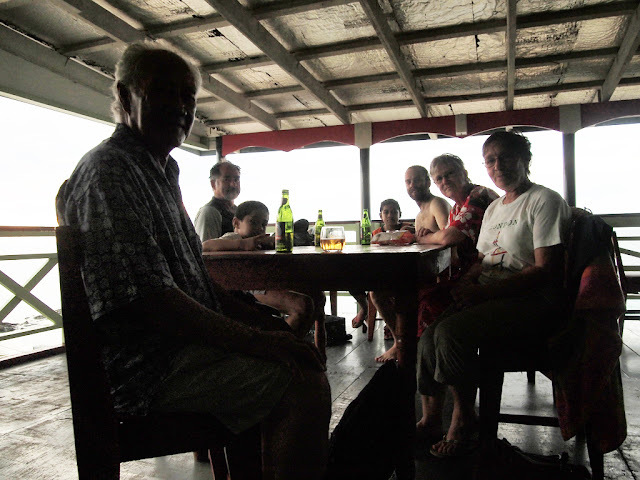 We stopped by Satuiatuta on our way back to the village for a beer and swim. Great way to end the day. This was the final day for Beryl, Marjorie and myself in Falelima. Before setting out in the morning for the Sataua Hospital with Beryl and Marjorie I snapped a few more pics around the village. I have to be honest, I never got a complete understanding of the functions and uses for all of the different fales around the village. I believe the men's gathering fale is nearest on the left. I think I saw her later at the dinner table. Local and free-range! View on the drive to the Hospital. Japan had also donate the ferry that runs between the two islands. Marjorie cynically interpreted the gift of this hospital as a place for the Japanese loggers to receive treatment for injuries when they were logging on this part of the island. There were some amazing views out to the water. One of the newer buildings was funded by the European Union. I was told: don't pet the dogs! Samoans don't have the same concept of pet animals that we have. Stray dogs are everywhere. A leaking water tank. Also a good example of a platform used to get the tank up off of the ground so that any lines running from the tank will have ample pressure and gravity feed. I had a lot fun with GoPro. 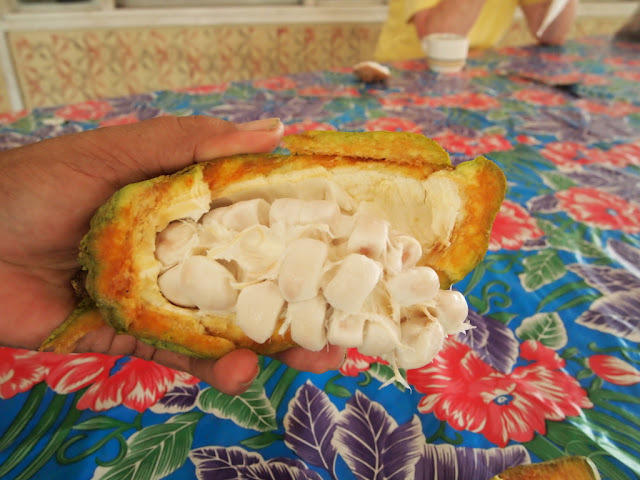 Back at the village a woman was husking (I guess that term works) cocoa beans from the pod. She took great delight in showing me the process! First you get a knife and hack into the pod. Then inside you find the cocoa beans. At this point their fine to pop in your mouth, soft and sort of gooey and as sweet as a lolli-pop. Finally Marjorie and Beryl had a meeting with the village elders. Their aim was to talk with them about the importance of simple hygiene, like washing hands before eating and to be certain that they're teaching these practices to the children. The meeting was filled with some pretty funny moments, mostly stuff that you had to be there for - sorry. There was one classic in which Marjorie sincerely asked the audience what do you do when you don't have water to drink? Lani translated for everyone and there was an immediate response back from one of the chiefs: we just wait until we die! The room erupted in laughter. The honesty was too perfect. Since it was our final evening we went to our favorite beach resort for a swim and beer. I also spent some more time playing with GoPro. The kids didn't join us and we didn't understand why until after dinner. I understood after our final dinner with the family why Fa'atupu didn't come swimming, he broke his piggy bank to go to the store (I don't know which one or where because there wasn't one anywhere nearby that I knew of) to get me a lava lava as a gift. It was just incredible. Such great kids! Friday morning we bid our farewells to Falelima and our wonderful hosts. The volunteers and the chief's family. 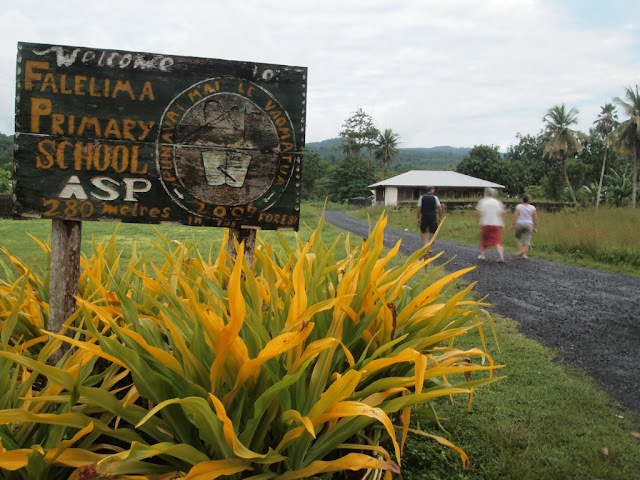 We stopped by the school on our way so Beryl and Marjorie could drop off some materials to the teachers. Looking south from the ferry. Manono is the island on the left and Apolima is on the right. Despite being tiny, people do live on these islands. Because Roy and Lani weren't returning with us (they stayed for another few weeks), we had to get ourselves from the ferry to Apia. We could take a taxi or a bus. As I recall the first taxi said something like 20 or 30 Tala. The bus was 2 Tala. Beryl and Marjorie made no hesitations in choosing the bus. While it only cost 2 Tala, we nearly paid with our lives! The brewery! Western Samoa was known as German Samoa in the early 1900s, without getting into too much of a history lesson, this is what the Germans left behind. Aggie Grey's Hotel. This is the most historic and popular hotel in Apia, and really, all of Samoa. It has quite an incredible history (NY Times article from 1982!). Aggie Grey was the daughter of a British immigrant who married a Samoan. She opened a sandwich stand in Apia during WW2 which catered to American GI's, the stand eventually became the hotel we know today. The place was incredible. Such an incredible contrast from village life! After some relaxing at Aggie's I quickly headed back out to explore Apia. The most commericial/touristic part of Apia. A main street of Apia and a McDonald's, naturally. Strange new building in construction. Apia has a massive market full of food vendors in one half and produce vendors on the other. Ice cream truck, Samoan style. There are beautiful patterns everywhere in Samoa. They're estimate is pretty close. Back at Aggie's for dinner - their special that evening was a Mongolian BBQ which was delicious. There was a great Samoan band playing in the background and there were also an incredible number of Mormon missionaries. Then it was off to the airport. I took a shuttle bus from the airport - the bus was nothing like the one we took earlier. When you go on a trip like this there are bound to be photographs which you weren't able to get. One of those for me was on the shuttle ride to the airport. Along the way we went through a residential neighborhood in Apia to pick someone up from a house. Along the way at a random street corner there was a very traditional fale that was glowing in light in which two men standing around a pool table. There could be no better illustration to describe the crossroads of traditional Samoa with modern Samoa. I finally met airport security that I liked. I don't understand why it isn't this simple everywhere. The runway the ocean and the black night sky beyond. This is the end. Incredible. I flew happily back to New Zealand and met up with my brother Erik and tour the north island. My week in Samoa was just spectacular. The people, the places, the conversations, the food, the hospitality...it was all just unbelievable and I really look forward to returning. Thank you for reading and I hope you've enjoyed all of the images! 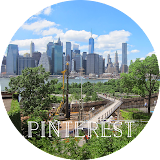 Thank you for sharing this wonderful guest post!